Wednesday Winner at Nicki's Diapers! New to Cloth? Become a Cloth Diaper expert!! Prefolds, pockets, and hybrids Oh MY! Post any of our banners on your sites/blogs and help spread the word about cloth diapers! 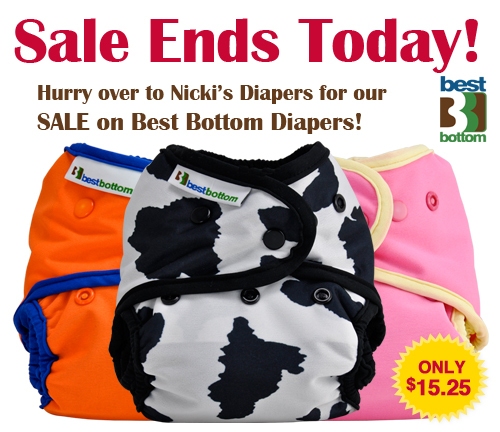 Last Day - Best Bottom Diapers on SALE at Nicki's Diapers! 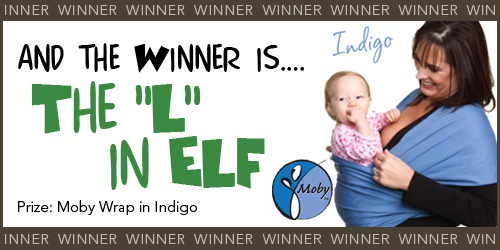 The L in Elf is the winner of the Indigo Moby Wrap! Please contact us at media@nickisdiapers.com with your address. You have 7 days to claim your prize. Regularly $18.99, NOW $15.99 Item of the Week runs Wednesday through the following Wednesday! Wednesday is DOUBLE DEAL DAY with overlapping Items of the Week! It's the middle of the night. Your baby wakes up, and you feel that dreaded cold, wet fabric clinging. A leak. Now instead of going back to sleep, you have to change a diaper in the dark and wake baby up even more...not particularly enjoyable with cloth OR disposable diapers. So how do you get through a night and stay dry? My experience with my two heavy wetter boys will hopefully benefit you. We ran the gamut of nighttime cloth choices. Prefolds and Blueberry minkee covers. No dice, leaks and midnight changes. Tried adding hemp doublers to things. Still not enough absorbency. Hemp seemed more absorbent, so we started using hemp fitteds. Success! No leaks! BabyKicks Organic One-Size Fitteds really work well for us at night, especially with an extra hemp doubler inside. Mother-ease One Size Fitteds in Bamboo Terry are awesome, too. Bamboo is so soft! As he got bigger, the covers just didn't seem comfortable for him, so we tried wool. Wool longies/soakers over hemp fitteds became our big nighttime solution. Wool is a GREAT cover option at night, as it won't shift and leave gaps that can leak. Breathable and comfortable, too. When the little one came along, we did the same with him right off the bat. The Mother-ease seemed trimmer and less overwhelming on him overnight, so for a long time it was one brand on one boy and another on the other boy...very confusing. Finally, I found one diaper that works great on both boys for overnight that isn't quite so difficult....Dream-Eze Organic Cotton AIO. For cotton, it is amazingly absorbent and I haven't had leaks! I love these diapers. is trim enough to be comfortable. Leaks? Add a doubler or switch to a wool soaker/longies. Too bulky? Switch to hemp or bamboo. Red bottom? Try adding a liner to wick moisture away from the skin. If, of course, you try some things and still need some help, call Nicki's Diapers and we'll be happy to troubleshoot with you. 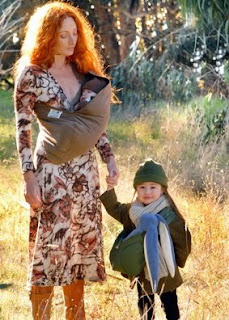 Ready for your chance to win one of the popular Moby Wraps in Indigo? There are a few ways you can enter. You can do each one of the entries however you must post back here to our blog and tell us WHAT you did. Be sure you follow the Nicki’s Diapers blog - publicly for your chance to win! We will post our winner on Wednesday, November 24th. Follow the Nicki’s Diaper blog publicly. Follow Nicki’s Diapers @nickisdiapers and Best Bottom Diapers @best_bottom on Twitter and Tweet about this giveaway. Leave the URL where you Tweeted. Like Nicki’s Diapers, Planet Wise and Best Bottom Diapers on Facebook - Be sure to state your facebook name when you post back here. Start or comment on a discussion on the Nicki's Diapers facebook page discussion board. Tag @nicki's diapers or @best bottom diapers in a facebook post. Have a friend subscribe to our blog. Post their username in your comment. You can do this as many times as you can get friends to subscribe! Talk about Nicki's Diapers on any forum and include a link to www.nickisdiapers.com. Sign up for the Nicki's Diapers newsletter (enter your email address on the top right of our homepage). Place an order at nickisdiapers.com, myswimbaby.com orclothdiaperclearance.com between 11-19-10 and 11-23-10. Include your order number in your entry. Many diaper companies offer the option of snaps or aplix (velcro, hook and tab) on their diapers. What's the difference? Mostly, it comes down to personal preference. There are some pros and cons that I can highlight for you, however, that might help you make an informed buying decision. Pros: I have always felt that you can get a more customized fit with velcro. No "between-snaps" size. I have heard others say that the fabric doesn't wear as badly around velcro tabs as around snaps, but I haven't experienced this firsthand. It can also be easier for caregivers to use -- no remembering which set of snaps to use. Cons: Velcro can curl over time, lose its sticky power, and some children (like my youngest) can learn to undo it more easily than snaps. Pros: More durable. Snaps never lose their hold. More difficult for little hands to undo. Cons: More likely to be "between sizes". Takes longer to do than velcro. Can be more confusing for caregivers. Sometimes causes wear on fabric. All said and done, I use both. Velcro BG 3.0s on my big boy, and I've switched to snap Best Bottoms for my little one as he learned how to undo the other covers. They each have their merits, which do you prefer?? 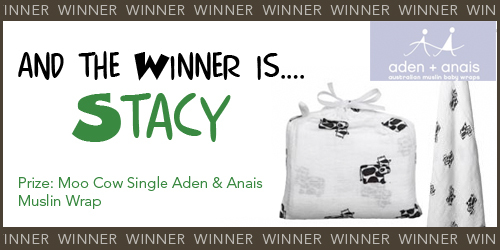 Stacy is the winner of the Moo Cow Single Aden & Anais Muslin Wrap. Please contact us at media@nickisdiapers.com with your address. You have 7 days to claim your prize. When I was pregnant, I started looking in to cloth diapers. I was amazed at how cool (and cute) they were. I started thinking of all the money we could save by using cloth. I thought about how my baby would never have to wear a plasticy, papery disposable diaper. Then I thought about how to convince my husband that we needed to do this. After the talk about money savings, better for baby, better for the environment, he couldn’t get past the ick factor. He was afraid that our washing machine was going to become a poopy mess. I explained how breast fed baby poop is water soluble, and that you just swish or spray off other poops. I did everything I could to assure him that our washing machine would do just fine. After all of that, I still couldn’t get him on board. Fast forward to August 2010. Our adorable little boy is 3 months old. We’ve been using sposies since the day he was born, and every poop equals a change of clothes. No matter what brand we tried, he leaked out of all of them. Then, one day, while buying a $40 box of diapers, I made a decision. We were going to try cloth, and I was going to convince my husband that this was the way to go. I was tired of ruined clothes, and money down the drain. Amazingly, my husband agreed! Two weeks later, I bought my first cloth diapers! I bought 5 bumGenius 3.0’s. It was enough to get us cloth diapering at least half the day, and I was washing every night. After about a week, we knew that we didn’t like the pocket diapers. They didn’t fit him well, and we were having leaking issues. We were going to buy Flip diapers, because we could get them locally, but we had a few concerns about them. We didn’t like the one-size insert, or the fact that there is nothing to hold them in place. We talked about buying Flips and making our own sized inserts, and possibly adding something to hold them in place. Then I did a Google search. And I discovered Best Bottom diapers. They had sized inserts, snaps to hold the inserts in, and they had double leg gussets to help hold in the poo. Yes please! They addressed all the concerns we had with the Flips, plus some. So, I sold my bG’s and ordered some Best Bottom’s. We immediately loved them. The materials are so nice (nicer than the bG’s I think), they are super trim, and they don’t leak! Better still, my husband loves them! We are now a full time Best Bottom family. I’ve even branched out and purchased some Imagine prefolds and Kissaluv’s contours. All from Nicki’s! As for my husband, he is officially a cloth diaper lover! He even offered to install a diaper sprayer for me, and I didn’t even have to ask! The wonderful people at Aden & Anais were generous enough to sponsor this giveaway! 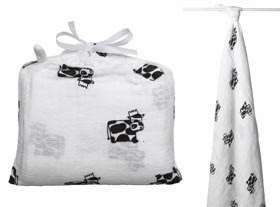 Here is your chance to win one of the ever popular Moo Cow Single Aden & Anais Muslin Wraps! There are a few ways you can enter. You can do each one of the entries however you must post back here to our blog and tell us WHAT you did. Be sure you follow the Nicki’s Diapers blog - publicly for your chance to win! We will choose our winner on Wednesday, November 17th. Follow Nicki’s Diapers @nickisdiapers on Twitter and Tweet about this giveaway. Leave the URL where you Tweeted. Tag @nicki's diapers in a facebook post. Place an order at nickisdiapers.com, myswimbaby.com or clothdiaperclearance.com between November 11th and November 16th. Include your order number in your entry. Item of the Week runs Wednesday through the following Wednesday! Wednesday is DOUBLE DEAL DAY with overlapping Items of the Week! So, during each pregnancy I have devoured diaper sales and rummage through every Sunday paper in search of fabulous coupons! By the time my last pregnancy ended, at over 41 weeks, I had 96 packages of diapers! Very proud of my bargains, I stacked them by size and stood back to admire my stash! We happily diapered our 4th baby boy in disposables for 6 months. I had never ever giving any positive thought to cloth diapering. “ That “ was for people who had tons of time, not a busy mom like me, and didn’t care about scrubbing poop! Boy was I wrong. If you had told me that by my sons 8 month birthday that I would be full time cloth diapering mom I would have told you that you were off your rocker!! My current obsession with cloth started innocently on You Tube as I watch videos of moms that clothed their babies. Then I posted my own video about my slight interest in cloth and the encouraging response was overwhelming! I decided I would purchase I few super cheap diapers on eBay……it was all down hill from there! I soon discovered much bigger sites to feed my need for cloth! After figuring out the lingo: inserts, Bummis, AIO, OS, I was hooked! Today we are a 100% cloth family, with a good sized collection of fluff and even have cloth wipes. I am still shocked by the amount of wonderful product to chose from and the warm knowledgeable community that surrounds cloth but I am over joyed to now know enough to share my experience with other mothers who inquire about cloth. Nearly one month after a life of disposables, we barely have any garbage, will save a ton of money with our next baby (whenever that is ) and whole heartily enjoy putting our chunky monkey in his adorable fluff! Needless to say we have returned all the disposables to the store! 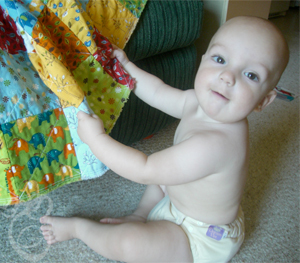 Do you think of diaper pins and plastic pants when you think of cloth diapering? There is a new generation Cloth diapers that are so far from this image, and cloth diapering is definitely something that families who want to save money should explore. You will not believe how easy it! It is budget friendly and Eco friendly!! I am not nearly as Eco-conscious as I wish I were. However, I am the stereotypical mother that many of you may think of when thinking of cloth diapering. I'm a baby wearer, I'm a breastfeeding mama, but at the same time, I am just a mom who enjoys saving some serious bucks. For disposable diapers, the average cost per diaper nationwide is $0.28 per diaper. The total cost for this figure (3 ½ years, 8 diaper changes per day) would be $2,862.72. For cloth diapering, the costs range widely and it can be difficult to give exact figures on how much these cost. 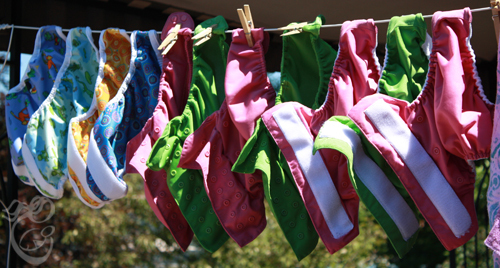 Cloth diapering (including the cost of cloth wipes & laundering) can range between $200-1300 dollars. This figure ultimately depends on whether or not you choose the most expensive diapers or the less expensive. Regardless of the style that you chose, you still come out financially ahead by using the cloth versus the disposable. Before you go shopping, know the lingo! Researching cloth diapering can be really overwhelmed - trying to figure out what types of diapers went with what, which was the best kind, what abbreviations mean. Ahhhh It can make a girl go crazy!!! They are a traditional cloth diaper with a thick strip down the middle. These are typically worn with a diaper cover. They are one of the least expensive options for cloth diapering & dry extremely fast! They come in three sizes- Preemie (4-10 pounds), Infant (newborn to 15 pounds) & Premium (15-30 pounds). These are more absorbent than the store brands such as Gerber. These are a very popular type of prefold on the market. Another option for prefolds are Indian Prefolds which are softer than the CPF and are made of gauze rather than twill. They are more absorbent, but can wear out a little faster than the Chinese Prefolds. When your child outgrows the preemie or infant size they work fantastic to double up your stuffing at nighttime. If you are interested in using the prefolds, you will need to purchase waterproof diaper covers too. A prefold can be folded inside of the diaper cover and the diaper cover simply covers the prefold and acts as a waterproof barrier. Fitted diapers also are used with Diaper Covers. Instead of using a prefold, you can use a fitted diaper which has elastic gathering in the legs and has snaps or a Velcro closure to keep the diaper together. Place the diaper cover over the fitted diaper, and you are go to go! Fitted diapers are some of our favorites! These diapers are very similar to the fitted, but are missing the elastic gatherings around the legs and waist. The diaper has wings that need to be fastened. These also require a diaper cover. Pocket diapers are usually made with two layers of fabric sewn together to form a pocket for an absorbent insert. This type of diaper just fastens on and does not need a diaper cover over it. Inserts are used for pocket diapers. They can be made of a variety of materials- micro-terrycloth, regular terry cloth, hemp, or you can just use prefolds as inserts. "Doubler" just means using more than one insert, which you could do if you were away for an extended amount of time or at nighttime before bed, to prevent leaking. Abbreviated to AIO. An All In One is a cloth diaper that has a waterproof cover and an absorbent inner liner that is all in one piece...hence the name. These diapers fasten usually with a hook/loop or snap fasteners. These are awesome! We love ours, however they do take longer to dry. Abbreviated to OS. A one size diaper usually fits the child from the day they are born (8lbs)until they are 30-35 pounds. These diapers usually have snaps that go across the diaper (making it smaller or bigger) and they can be folded over to create smaller sizes. As the child grows, the snaps on the legs can become larger. Our Favorites!!! We love BumGenius. A wool soaker is a diaper cover that is made exclusively of wool. Wool has a high lanolin content, so it works well as a diaper cover. Wool is really quite amazing! You can get knit wool in many different styles: Soakers, Pants, Shorts, and even skirts! If you are going to explore this option you will need to do extra research on them. Wool need special care. How do I wash and take care of Cloth Diapers? All of the above diapers & covers can go in the washing machine, excluding the Wool. I put in two tablespoons of detergent. I recommend an additive free detergent or a detergent specifically for cloth diapers. This will help prevent detergent build up in you diapers that can cause stink. If the diapers have been stained I like to have a stiff bristled brush on hand. I rinse the stained diaper under hot water and give it a nice scrub, this can really help get rid of the stain or at least fade it. When you are ready to wash selected hot/cold. I like to end with a second rinse. You can throw all the diapers in the dryer. You can throw just the prefolds and diaper inserts into the dryer and dried them on medium-high heat. 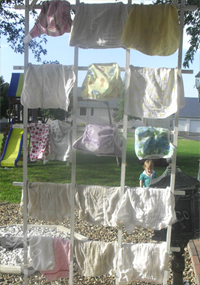 The diaper covers and pocket diapers can be line dried- weather permitting. They will dry quickly. Another option for staining is in the sun. The sun acts as a bleaching agent and can take any staining out of them, literally within a couple of hours! NEVER ever use any fabric softener or fabric softener sheets when washing your diapers. The fabric softener leaves a residue that can cause your diapers to no longer absorb, and they will leak. Always check the manufacturer's guidelines for each particular type of diaper that you buy on how to wash it and if the diaper needs several washes before being use. Read those guidelines and use your own best judgment on how you choose to launder your diapers. Why are my diapers leaking? Probably time to strip your diapers. If your diapers have been absorbing fine and all of a sudden the diapers stop absorbing, they may need to be stripped. Two or three washes (without detergent) should do the job. It is very important to not use a ton of detergent- two tablespoons or less does the trick and diapers always smell fresh and clean. Brown spotting on my diapers- it's not poo. What could that be from? Diaper rash creams can leave spotting on your diapers. Make sure to only use diaper creams that say that they are "safe for cloth diapers". However if you find yourself needing to use a regular diaper cream, its easy to just lay a fleece doubler in the diaper. This keeps the cream from touching the diaper, and then I didn't have to invest any money into special creams. What about cloth diapering a newborn? I didn't find cloth diapering a newborn to be as difficult as everyone claimed it would be. And I did it with Twins!!! We did have a box of preemie/newborn disposable diapers, until the babies fit the cloth diapers. 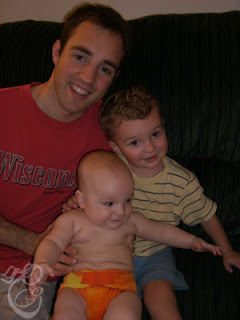 Once the twins were finally enough to fit in the cloth diapers, we never looked back. The laundry was not as much of an issue as every said and thought it would be either. When you have a newborn twins, you are already throwing in load after load. One more load didn't seem bad because of how often we were already doing the laundry. I'm done with diapers, Now what? If you are planning on having more children, I would suggest keeping them for the next child. When the next child comes, you will have no diapers to buy! If this is your last child though, selling the diapers can be a great way to make back some of the money you spent on them. Some of my favorites are Prefolds with Wool covers - bumGenius 3.0 - Bummis Covers - Bummis Bamboozle - Flip - Monkey Doodlez AIO. A great little tip: buy 1or 2 diapers each of the brands/styles you are interested in. That way you can explore a bunch of different diapers, find out what works the best for you and your baby, and not break the bank. You'll know exactly what you want and will be able to create the stash you want with diaper you know you like! Now, go forth and Cloth Diaper with confedence!! By Guest Blogger: Britni - Mama to 3, cloth diapering Twins!! When I had my first son two years ago, cloth diapering was not even an option. I knew nothing about it and didn’t even consider it. I had one friend who clothed and I was briefly exposed to a prefold and snappy and that was it. So for us it was disposables, the mass amount of money we literally were throwing away. So 6 months after our son was born we were given the shock of our lives…baby number two was on the way. Yes, more diapers, more clothes, more food, and less sleep. As we crunched the numbers over and over again, me working was not an option with the cost of childcare. With that being decided, I knew we had to cut costs so I started researching cloth diapers thinking this would be a great way to save money. Boy was I amazed at what I found. Not only were there prefolds but pockets, AIO, AI2, hybrids, covers, WAHMS, fitted, wool, and organic. I was so overwhelmed and didn’t know where to begin. Luckily that wonderful friend that first exposed me to this bizarre concept was able to shed a little light on all of this and refer me to a local class at a cloth diapering store. So I got my husband on board (well as much as I could) and convinced him to take me to the seminar, which was an hour away. It was very informative but still overwhelming. With baby number two fast approaching I bought a Bum Genius One Size pocket to try along with some fitted with covers. We tried the BG on our 1 year old and thought this was it. It was easy, worked well and looked adorable. Well now that we were about to go down to one income, the upfront cost of buying new diapers was not in our budget. Insert Nicki’s Diapers gently used section here. Oh Nicki’s Diapers… It has been my best friend and worst enemy. You can get such great deals but it becomes SO stressful because you want to be the first one to get the deal and don’t want to miss anything. I was able to snag some great newborn Bum Genius diapers that worked really well. We later moved onto Fuzzi Bunz sized diapers (another great find at Nicki’s Diapers gently used section) and I even convinced my mom to get me some brand new diapers as a gift. How did I learn what what worked and what didn’t? Trial and error. If my son soaked through something is one wetting then I knew it would not work for us. Also I looked at convenience of it. Pockets are great for going out (also they are so cute) and the husband prefers to put those on. I still consider myself a newbie when it comes to clothing. We clothed until about 6 months and then we started using disposables again for some reason. We recently started clothing again and are loving it. We do it full time and I couldn’t be happier. In our stash are mostly prefolds, covers, and pockets of all brands. I still feel there is so much out there to learn. I have not gotten the perfect wash routine down, haven’t found the perfect night or nap diaper, and haven’t tried all the wonderful brands and types out there. My advice to newbie’s… if you can attend a workshop. They are informative and very helpful. Try as many types as you can, even if its one of each so you can figure out what works best for you. Nicki’s offer packages where you can get a variety to try and can send back what you don’t like. It's their 15 day promo. Don’t give up. Clothing takes a lot of work in the beginning. It’s hard to figure things out but everyone in the clothing business is very helpful. Don’t be afraid to stray from the “name brand” diapers. Yes they are wonderful but there are also a lot of wonderful diapers out there at great prices. So take a deep breath, research and try to talk to someone, and enjoy that fact that you are saving money, saving the earth, and covering your little ones bottom is the most adorable diapers out there. 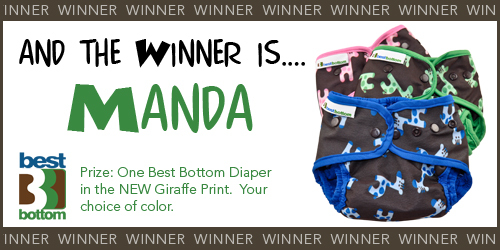 Manda is the winner of one Best Bottom Diaper in the NEW Giraffe print. Please contact us at media@nickisidiapers.com with your color preference and address. You have 7 days to claim your prize. This item will ship once Best Bottom Diapers' new print arrives at Nicki's Diapers which is expected next week. Many women get resistance from their partners when it comes to cloth diapering. I'm going to stereotype heavily in this post, and I know there are a lot of men out there who don't fit these generalizations, but just go with me here -- it'll be useful to many, I promise. So, you want to cloth diaper. Whether it's baby #1 or #6, sometimes daddy isn't on the same page. How to convince him? Try these. Dollars and "sense" - Lots of men (mine included) see things in numbers. Explain to him how much money you'll save, and he might see things your way. Show him it's EASY. - Start him with All-in-One styles or stuff pockets ahead of time for him. Make it just as simple as using a disposable. Take more on yourself. - Tell him he won't have to worry about the wash routines. Take care of that part yourself and you might have a lot more willingness to try. Make it convenient. - Set them out where they're easily grabbed. Make diaper pails accessible. MORE accessible than trash cans. With my husband, I had to bring in the money savings, explain that it wouldn't be any more work for him (I do the laundry) and I usually pre-stuff pockets as well. He whines when cloth wipes aren't in their bin and when I haven't had a chance to put the clean diapers away on their shelf. He likes to know exactly what to use, where they are, and how to use them. If he thinks there's a chance that he'll do it incorrectly, he's just not going to do it. If your partner is willing to try, make it easy for him to succeed. By Guest Blogger - Casey U. It all began as a way to save money. We needed to cut back on things and we had two (yes two) in diapers and the one thing that always came up when money was tight or non existent was diapers. Oh how I hated buying diapers on my grocery shopping trips. Here I was making sure I was watching what I spent and with one quick swipe, you added $40 dollars (for two) to your bill and on top of that, with one quick change, that $40 got thrown in the garbage! So after much research, we decided to try cloth. At first it was completely economical. I did however love the way their little bottoms looked all fluffy and cute in their cloth diapers but because if costs, we couldn’t afford to completely cloth all the time so we slowly had to build our stash (and in ours I mean mine). Well I convinced someone to get me diapers as a present (this should have been the first sign there was an…issue). So I was introduced to brand new fluffy, soft, never been used diapers. Oh I was in love! 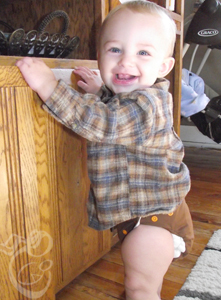 I wasted no time putting them on my son and oh the bright little bottoms waddling around… how can you not love cloth. For a while I was ok. I stayed away from any of the websites. Luckily the nearest diaper store was an hour away so going that was not an option. So for awhile I think the addiction died down. My son grew out of our first stash and we didn’t have money to buy another one so we switched to disposables (oh the wasted money). I passed on my stash to a friend for her to use (is it normal to miss your diapers?) I did keep the new ones because they were OS so I planned on still using them (ok ok and because I couldn’t bare to part with them). Well money got tight again and those dreaded disposables were killing me. I started using my 4 diapers and just washing every day. I was then lucky enough to find out our store was giving away free boxes of Econobums. I packed my boys in the car and we drove the hour (over an hour with a two year old and one year old) and got our diapers. This was all it took, one trip to the store and seeing all those cute diapers. I was hooked! Well I had all these new econobums and some prefolds I bought so I needed come cute covers right? Well I found out that a store opened up locally (oh no, this could be trouble) so I headed there. $50 later I walked out with 2 thirsty covers, fleece liners, disposable liners, some snappi’s and a full blow love and addiction to cloth. It doesn’t help that every cloth diaper store I have been in has a play area so I can shop in peace and my kids are happy. Ok so I might have a slight problem… Hello name is Christina and I am a cloth diaper Addict! My cloth journey began unexpectedly after venting about my "trash guilt" on Facebook. I had three little girls all in diapers and the sheer volume of trash that created each day was insane. I am a big recycler and recyle anything and everything I can yet we were producing an average of one bag of trash per day filled with almost nothing other than diapers. In my status vent I did not mention anything about cloth diapers, just my guilt over all the disposables. Yet, suddenly everyone wanted to help me learn how to use cloth. I had no clue so many of my friends even used cloth. I was shocked and touched at their willingness to help me. They were all so excited about it and kept using all of these strange and unfamilar terms. I decided I would humor them and give it a shot. One awesome friend even offered to send me some cloth diapers to get me started because my number one complaint, or should I say excuse, for not being able to switch was the start up costs. How could I say no to that? I agreed to try knowing it would be too hard and I would fail at it. I had three girls in diapers after all, no one would fault me if I couldn't do it. Then I could go back to disposables guilt free and be able to say "I tried, BUT......"
I received the diapers in the mail a few weeks later and decided to start slow, using cloth only on my oldest daughter at first. I didn't want to jump in feet first trying to cloth diaper all three girls 100% of the time because I knew that would overwhelm me quickly. I decided I would start out part time, only using the cloth during the day while we were at home. I still used disposables on her anytime we went out and at bedtime. The first few times I put the cloth on her it was awkward, for both of us. Diaper changes went from taking about 30-60 seconds to easily lasting 5 minutes as I clumsily tried to get everything on just right. I couldn't help but chuckle after each diaper change as I watched her walk away funny, like she had been riding a horse all day. The extra fluff would definitely take some getting used to. After about 2 days I was shocked to realize I was already getting the hang of it. It was WAY easier than I had ever expected. Dare I admit it? Did I actually enjoy it? This couldn't be happening, everything was going all wrong. This was not the plan at all. She hadn't pooped yet, I knew that would be the end of this silly journey. Bring on the poo baby girl. Later that day SHE POOPED! Finally it was surely over! I went to change the poop and it wasn't that bad. What was happening here? Laundry time rolled around. I knew this would be "the end". There was no way the diapers would wash clean. I started the laundry and it wasn't as gross or hard as I thought. Our washing machine had so many different options like a prewash, soak, and 2nd rinse cycles, perfect for cloth diapering. The diapers came out so clean and fresh. Now what? Bring it on! A few days went by, everything was still going smooth. Dare I try two in cloth? Sure, why not. So I put the youngest in cloth as well. I was still a tad concerned about trying my middle girl out because she is my little soaker. She can soak through a disposable in an hour to the point where her clothes are wet too. I knew there was no way these silly little cloth diapers could contain her when a hefty disposable could not. A few more days passed, now I had 2 in cloth and 1 in "sposies." OH MY! What just came out of my mouth? Now I am using "their" language. Sposies? Prefolds? Pockets? Covers? Snappis? What was this strange new language I was speaking? My whole day was filled with diaper speak as I bragged to all of my friends about how our journey was unfolding. A week in and it was still smooth sailing with the two. No accidents, no leaks, no blowouts. I kept waiting for something, anything to go wrong so I could give it all up but nothing ever did. Then I asked myself "Do I make the leap? Do I add a third into the mix?" Oh what the heck, why not. So I added a third tush into the rotation. Now I was proudly cloth diapering all three girls. Still only part time, only at home and while they were awake but I was doing it. I had wanted it to be hard. I wanted to fail so I could say I had tried. I wanted to be able to say I had put my best effort into it but it was just impossible with three. Who would blame me then? I had THREE! Maybe if it was just one little baby I could do it, but surely not three. No one would expect that. I felt so guilty knowing I had started with the intention of failing but ended up enjoying it so much. My name is Christy, and I am a cloth diaper addict. Ah, it feels so good to get that off my chest.